I just got these great dry ice whiskey stones from HomeCo. These things are great! Now just because they are called whiskey stones doesn’t mean you can only use them with alcoholic drinks cause I use mine in all kinds of drinks. Just throw these in the freezer and they will get extremely cold. Put a couple in your drinks and it will keep your drinks super cold. The best part is that they won’t melt like ice cubes so you don’t have to worry about your drink getting watered down! They work really well and keep your drink chilled for hours without the melted water in your drink!! Perfect for entertaining! This set is really nice it comes with four of the stainless steel ones and four of the stone ones. The set comes in a protective plastic case which makes it really easy to store them because what happens in our house is they get lost because they just get thrown in a drawer. It also comes with a set of tongs so you can use it to pick them up with (they get really cold so this can come in handy)! These cubes will never Wet you down. 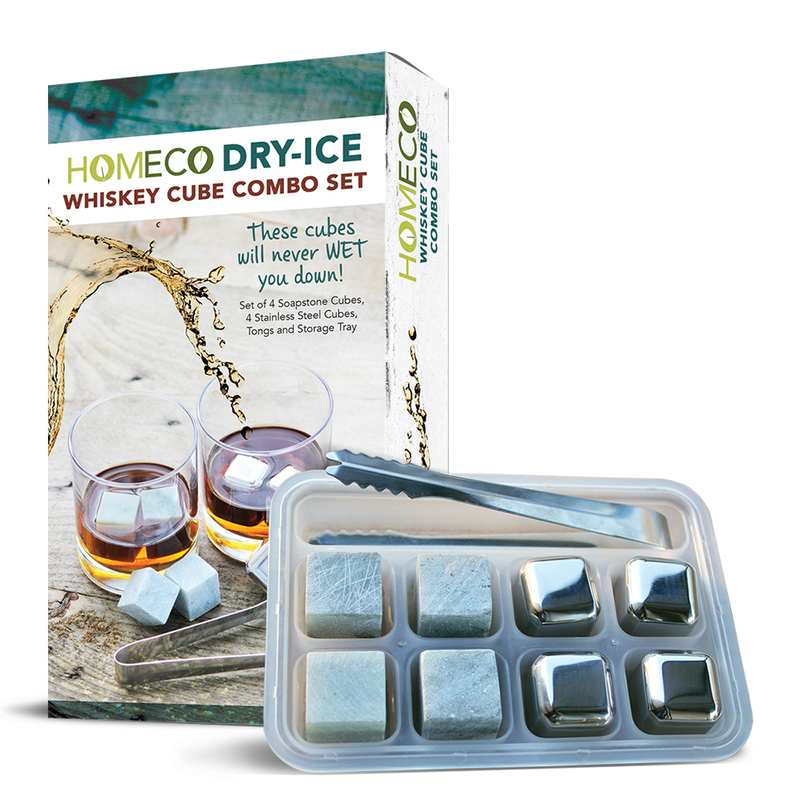 ALL INCLUSIVE, JUST ADD YOUR FAVORITE WHISKEY: Set Includes 4 Stainless Steel cubes, 4 Soapstone cubes, an Ice Cube Tray, and a Set of Tongs. The sky is the limit on which of your Favorite Whiskey or Wines to pour these over cubes. Have fun; you deserve the Best! Works well with: Jana Kramer, Jameson, Two Gingers, Wyoming, Irish, Jack Daniels, Wild Turkey, Rye, Bourbon, Jim Beam, Rolling Stones, and many more. THE REAL DEAL…NO MORE MELTED ICE CUBES: When using Dry-Ice you never have to worry about watering down your favorite drink. Dry-Ice Cubes do not melt or impart any flavors to your drink. Just Enjoy the Taste of your Favorite Whiskey or Wine. STORES EASILY IN COVERED TRAY: With Dry-Ice you will have all your cubes in one ice cube storage tray. READY-SET-PARTY: Store in the freezer and they are always ready to be the talk of the Party. Our cubes always make the Perfect Gift when attending a Party for that person who has everything but DRY-ICE WHISKEY CUBES! PERFECT COMBO GIFT FOR THE MONEY: With this set you get it all, stainless and soap stone cubes. No more ordering from multiple sources. Share your amazing find with your Friends or Family. Save Money by ordering two or more today – you will get Free Shipping on orders over $35. And you don’t have anything to lose; Orders are Protected by Amazon’s 30-Day Satisfaction Guarantee. Instead of a return, you will be ordering more to share with everyone! Great gift for: Boss, Father’s Day, Birthday, Groomsmen, or just because, for any whiskey connoisseur.